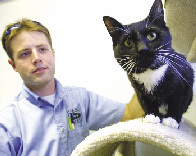 Cat Power: Patrick Pedrotti at Humane Society Silicon Valley with a sharp-dressed feline. Andrew Hill Adult Center 3200 Senter Rd, San Jose. 408.347.4390. Immigration and Citizenship Program Center for Employment Training, 701 Vine St, Room 112, San Jose. 408.534.5454. Independence Adult Center 625 Educational Park Dr, San Jose. 408.928.9300. Metropolitan Adult Education Program (MetroED) Locations: Campbell Center, 1224 Del Mar Ave, San Jose, 408.947.2300. Capitol High School, 760 Hillsdale Ave, San Jose, 408.723.6550. Erikson Adult Center, 4849 Pearl Ave, San Jose, 408.723.6450. San Jose Center, 275 N. 21st St, San Jose, 408.947.2311. Mountain View/Los Altos Adult School 333 Moffat Blvd, Mountain View. 650.940.1333. National Hispanic University 14271 Story Rd, San Jose. Overfelt Adult Center 1901 Cunningham Ave, San Jose. 408.254.8101. Palo Alto Adult School 50 Embarcadero Rd, Palo Alto. 650.329.3752. Yerba Buena Adult Center 1855 Lucretia Ave, San Jose. 408.347.4766. Advanced Testing Center 25 N. 14th St, San Jose. 800.809.9252. HIV, STD, Hepatitis, allergy testing. American Red Cross HIV/AIDS Testing 408.577.1000. CompreCare Clinic-Alum Rock Health Center 3030 Alum Rock Ave, San Jose. 408.272.6300. The Crane Center 976 Lenzen Ave #1800, San Jose. 408.792.3720. Gardner Health Center 195 E Virginia St, San Jose. 408.918.5582. Heads Up San Jose 938 The Alameda, San Jose. 408.278.6932. Indian Health Center of Santa Clara Valley Inc. 1333 Meridian Ave, San Jose. 408.445.3400. MayView Community Clinic 270 Grant Ave, Palo Alto. 650.327.1223. Medical Testing Center 15251 National Ave #205, Los Gatos. NIGHT Mobile Health Van Program (Neighborhood Intervention Geared to High-Risk Testing) (Santa Clara County Dept of Public Health) 408.494.7893. Mountain View Health Center 225 San Antonio Rd, Mountain View. 650.948.0807. Planned Parenthood San Jose—Eastside Health Center, 3131 Alum Rock Ave, San Jose. 408.729.7600. San Jose—Mar Monte Community Clinic, 2470 Alvin Ave #80, San Jose, 408.274.7100. San Jose—Blossom Hill Health Center, 5440 Thornwood Dr #G, San Jose, 408.281.9777. San Jose—The Alameda Health Center, 1691 The Alameda, San Jose, 408.287.7526. Santa Clara County AIDS Program HIV Antibody Test 408.299.5915. Sunnyvale Health Center 604 E. Evelyn Ave, Sunnyvale. 408.739.5151. Al-Anon and Alateen Family Groups 1 W. Campbell Ave, Campbell. Betty McKeowen Center 1281 Fleming Ave, San Jose. 408.293.6372. Combined Addicts and Professional Services (CAPS) 66 E. Rosemary St, San Jose. 408.441.6088. Fortune's Inn 52 S. 12th St, San Jose. 408.224.7778. House on the Hill 9500 Malech Rd, San Jose. 408.281.6570. National Council on Alcoholism and Drug Dependence 1415 Koll Circle #101, San Jose. 408.292.7292. Recovery Through Support Support Systems Homes Inc., 1 W. Campbell Ave #E45, Campbell. Humane Society Silicon Valley 2530 Lafayette St, Santa Clara. 408.727.3383. Safe Haven Animal Sanctuary 21265 Stevens Creek Blvd #205-427, Cupertino. 408.420.7233. Silicon Valley Animal Rights 4420 Alpine Rd, Box 114, Portola Valley. 650.851.9513. Wildlife Center of Silicon Valley 3027 Penitencia Creek Rd, San Jose. 408.929.9453. Immunization Program (Park Alameda, San Jose) 976 Lenzen Ave, Room 1300, San Jose. 408.792.5200. Fridays 8:30am-4pm. MayView Community Health Center 270 Grant Ave, Palo Alto. 650.327.1223. Planned Parenthood: San Jose—Blossom Hill Health Center, 5440 Thornwood Dr #G, San Jose. 408.281.9777. San Jose—Mar Monte Community Clinic, 2470 Alvin Ave #80, San Jose. 408.274.7100. San Jose—The Alameda Health Center, 1691 The Alameda, San Jose. 408.287.7526. Sunnyvale Health Center 604 E. Evelyn Ave, Sunnyvale, 408.739.5151. Adult & Child Guidance Center 1 W. Campbell Ave, Campbell. 408.374.9220. Alliance for Community Care 438 N. White Rd, San Jose. 408.260.4040. Almaden Valley Counseling Service 6529 Crown Blvd #D, San Jose. 408.997.0200. Almaden Institute 4990 Speak Lane #100, San Jose. 408.266.7826. Catholic Charities Community Counseling and Education Services 2625 Zanker Rd, San Jose. 408.944.0469. Ikeda, Linda—Hope Counseling Center of Silicon 1101 S. Winchester Blvd #K236, 408.247.1600. Kara Grief Support 457 Kingsley Ave, Palo Alto. 650.321.5272. Perrotta, Emily O—Marriage Counseling Service 1745 Saratoga Ave, San Jose. 408.446.1093. Process Therapy Institute 16573 Los Gatos Almaden Rd, Los Gatos. 408.358.2218. The Santa Clara County Crisis Hotline 408.279.8228. Tino E Esparza Counseling Center 1972 The Alameda, San Jose. 408.296-0936. Touchstone Support Network 3041 Olcott St, Santa Clara. 408.727.5775. Turning Point Counseling Center 16548 Ferris Ave, Los Gatos. 408.356.0453. YWCA of Silicon Valley 375 S. Third St, San Jose. 408.295.4011, ext. 259. Children's Health Initiative (CHI) 800.CHI.5222. The Health Trust 2085 Hamilton Ave #150, San Jose. 408.559.9385. Healthy Silicon Valley 2085 Hamilton Ave #150, San Jose. 408.879.8428. Pacific Free Clinic Overfelt High School, 1835 Cunningham Ave, San Jose. Bill Wilson Youth Center 3490 The Alameda, Santa Clara. 408.243.0222. Brandon House 1716 E. San Antonio, San Jose. 408.258.6146. City Team Ministry Rescue Mission 1174 Old Bayshore Hwy, San Jose. 408.288.2153. Emergency Housing Consortium Reception Center 2011 Little Orchard St, San Jose. 408.294.2100. Inn Vision: Julian Street Inn 546 W. Julian St, San Jose. 408.271.0820. San Jose Family Shelter 1590 Las Plumas Ave, San Jose. 408.926.8885. Sobrato Family Living Center 1509 Agnew Rd, Santa Clara. 408.855.8506. Adult Protective Services (APS) (helps hurt or neglected elders) 800.414.2002. Bay Area Legal Aid (BayLegal) 2 W. Santa Clara St, Eighth Floor, San Jose. 408.283.3700. The Legal Aid Society W. Robert Morgan Legal Services Center, 480 N. First St (at Empire Street), San Jose. 408.998.5200. The Public Administrator (handles estates for decedents without family) 408.534.2500. The Public Guardian/Conservator (for those unable to care for finances or who are incapacitated) 408.534.2500. Supplemental Security Income (SSI) (money to seniors, blind, disabled) 800.772.1213. Almaden Valley Youth Counseling Service 6529 Crown Blvd #D, San Jose. 408.294.0500. Alum Rock Counseling Center 1245 E. Santa Clara St, San Jose. 408.294.0500. Choices for Children 111 N. Market St #100, San Jose. 408.297.3295. Community Pregnancy Center 1150 Hillsdale Ave #104, San Jose. 408.978.9310. Family and Children's Services 950 W. Julian St, San Jose. 408.292.9353. Indian Health Center 1333 Meridian Ave, San Jose. 408.445.3430. Medi-Cal Offices 1919 Senter Rd, San Jose. 408.271.5500. Planned Parenthood 1691 The Alameda, San Jose. 408.287.7532. Santa Clara County Juvenile Probation Services 408.278.5900. Teen Health Line at Lucile Packard Children's Hospital 888.711.8336. YWCA 375 S. Third St, San Jose. 408.295.4011, ext. 214.